Bacterial colonization in chronic wounds can significantly delay or entirely prevent wound healing.1 Therefore, detection of significant bacterial burden in a wound typically mandates a change in treatment plan towards one which targets bioburden. Real-time detection of bioburden currently relies on subjective, qualitative visual assessment of clinical signs and symptoms (e.g. pain, exudate, crusting, swelling, erythema, foul odour, friable granulation tissue, and heat). Yet high levels of bacteria often occur in the absence of signs and symptoms, even some cases of wound infection.1-3 Without real-time confirmation of the presence and spatial distribution of bacterial burden within and around a wound, clinicians are at risk of making inappropriate and ineffective treatment decisions. "The MolecuLight i:X gives clinicians the ability to visualize and therefore target treatment towards clinically undetectable critical colonization. This user friendly point-of-care device is an exciting addition to our wound care protocol." 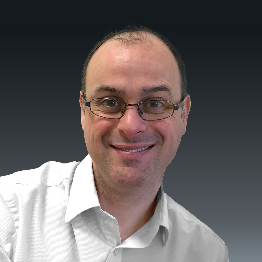 David Russell, MD is a consultant vascular surgeon at Leeds Teaching Hospitals NHS Trust, located in Leeds, West Yorkshire, UK. Patient Condition: 60 year old patient with diabetic foot ulcer (> 5 months) on left plantar heel. 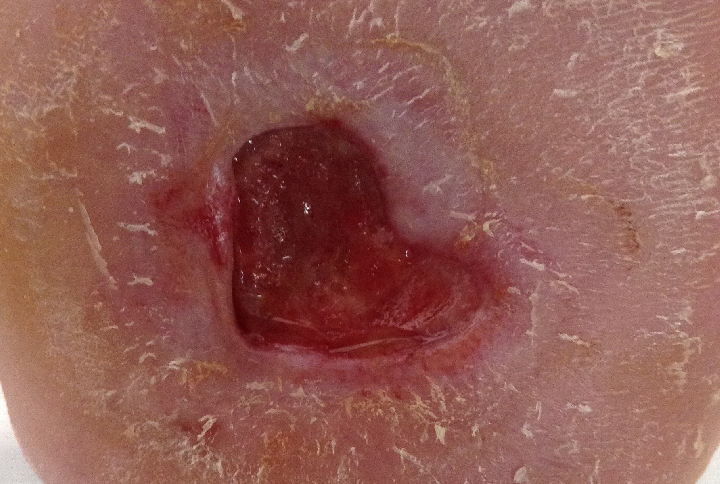 Patient exhibited no clinical signs or symptoms of infection, received regular debridement, and offloaded the wound via a total contact cast, yet the wound was deteriorating rapidly. 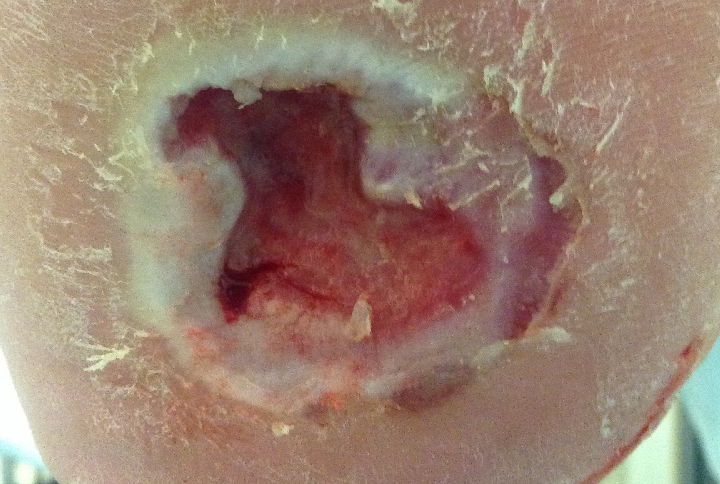 This diabetic foot ulcer patient had significant wound deterioration (3-fold area increase over 4 weeks) despite aggressive offloading, good vascularity, and no clinical signs or symptoms of infection. 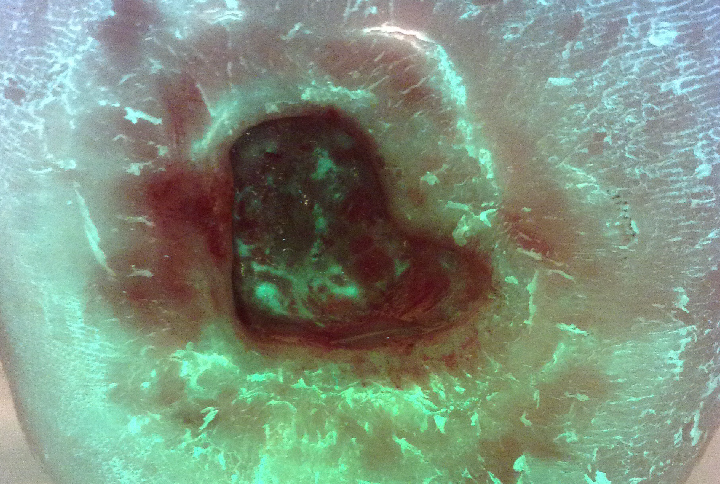 After routine debridement the wound was imaged for bacterial fluorescence using the MolecuLight i:X Imaging Device. 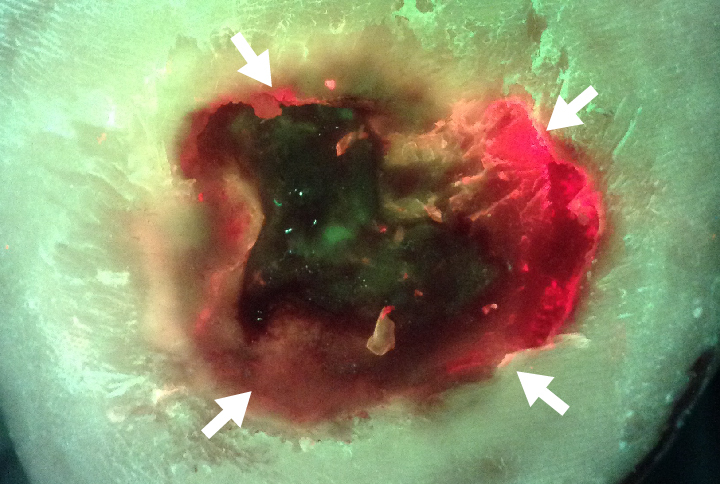 Despite clinician confidence that the wound did not harbor significant bioburden, images revealed prominent bacterial (red) fluorescence which persisted after additional cleaning. The presence of red-fluorescing bacteria prompted the clinician to switch to a honey-based antimicrobial dressing. However, after two weeks on this optimized treatment plan, this previously deteriorating wound was on the path to healing. 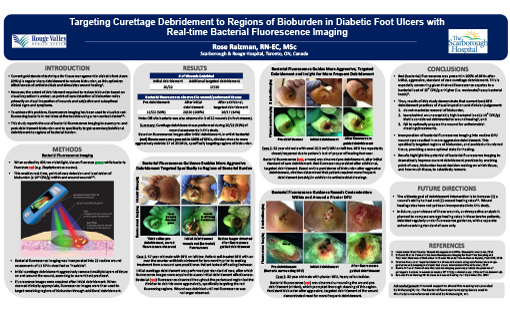 The wound area of this diabetic foot ulcer had decreased by 45% and bacterial fluorescence was no longer visible (Figure 4). Images provided by David Russell, MD, Leeds General Infirmary, Leeds, UK. 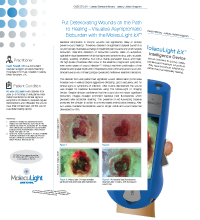 MolecuLight Clinical Case Study 0056. Edwards R, Harding KG. Bacteria and wound healing. Curr Opin Infect Dis. 2004;17(2):91–96. Gardner SE, Frantz RA, Doebbeling BN. The validity of the clinical signs and symptoms used to identify localized chronic wound infection. Wound Repair Regen. 2001;9(3):178–186. 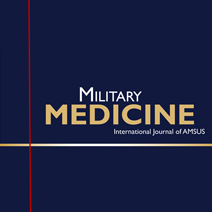 Serena TE, Hanft JR, Snyder R. The lack of reliability of clinical examination in the diagnosis of wound infection: preliminary communication. Int J Low Extrem Wounds. 2008;7(1):32–35.